Autograph album started in 1886 by William Irving Smith, "Will", of Strong, Maine, with most inscriptions from his student years at Farmington State Normal School at Farmington, Maine. The institution is now known as the University of Maine Farmington. See another post that deals with Will's autograph album started in his senior year, 1888, at Farmington State Normal School. Many people inscribed pages in both albums. 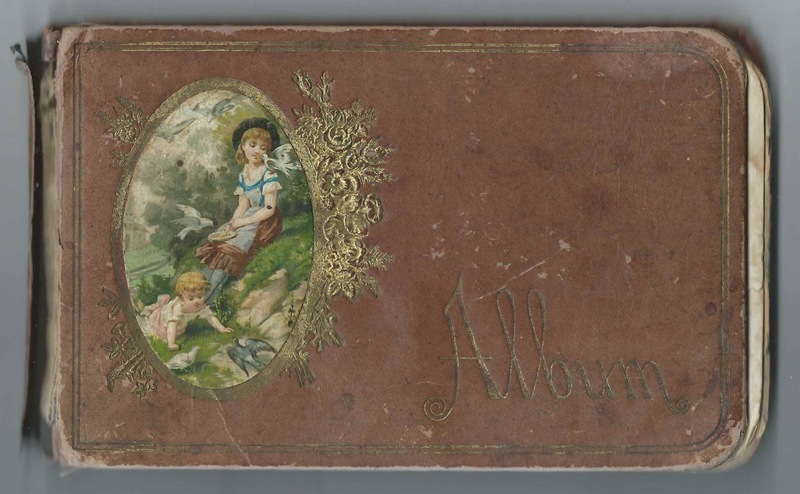 The 1886 album measures approximately 6-3/4" by 4-1/4" and contains the sentiments of 49 of Will's friends and schoolmates. An alphabetical surname list and an alphabetical list of the inscribers, together with any personal information they offered, appear at the end of this post. William Irving Smith, or William Irvin Smith, "Will", was born April 9, 1867 at Phillips, Maine, the son of Andrew Fuller Smith and Harriet Angeline (Goding) Smith. I'm not sure if Will taught school after graduating from Farmington State Normal School, but by the time of the 1900 Census, he had become a manufacturer, perhaps the novelty mill where he had a stook fitter, as described in the 1930 Census. I believe he married twice: 1) Clarinda Hoyt, whom he married on August 21, 1897 at Strong, Maine and with whom he had a daughter Alice, who would marry George Harrison Beal in 1914; and 2) Arvilla Frances (Bean) Cox Goldsmith, whom he married about 1925. Will died in 1934 and is buried at the Strong Village Cemetery at Strong, Maine, with his first wife Clarinda. If you have corrections and/or additions to the information above, please leave a comment or contact me directly. 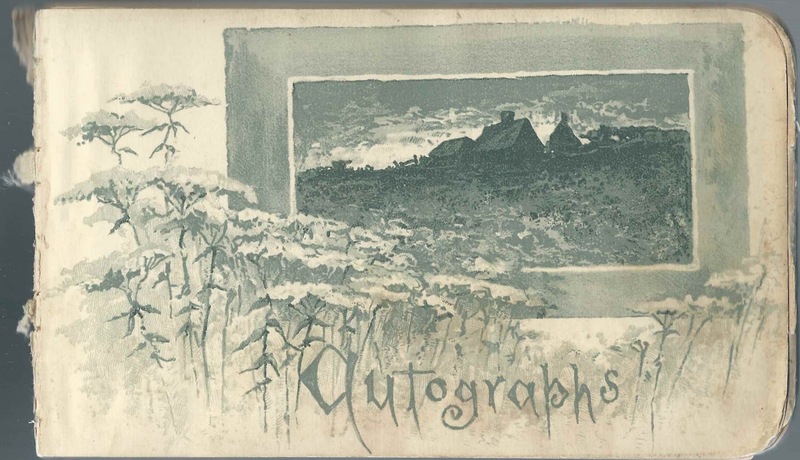 See the link in the second paragraph to view details on the autograph album Will started in his senior year at Farmington State Normal School. A. Lewis, inscribed during the Fall Term of 1887 at Farmington State Normal School. 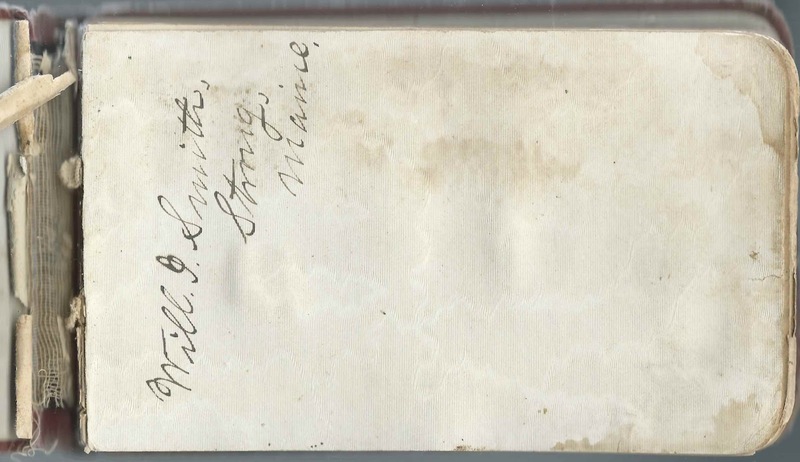 Middle initial might be V.
Susie N. Locke of Farmington, Maine, inscribed on June 9, 1888. Daughter of inscriber Mrs. Daniel Mosher Locke - Eliza M. (Bickford) Locke.